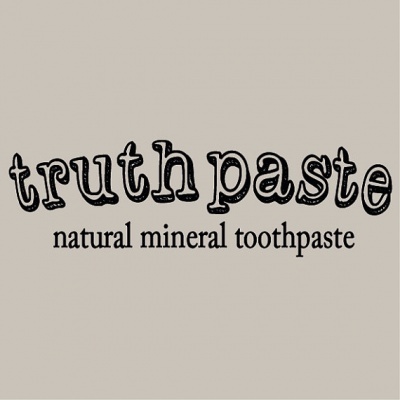 truthpaste is 100% natural and organic mineral toothpaste that supports teeth remineralising and healthy gums. Handmade in the UK. Available in a reusable glass jar. truthpaste is a handmade natural toothpaste with Natural Clays, Aloe Vera, Neem, Myrrh, and Certified Organic essential oils. Suitable for vegans. It is free from fluoride, SLS /SLES, triclosan, glycerin and No Palm Oil. It doesn't contain any foaming agents, bleaching agents, colourants, or artificial ingredients. 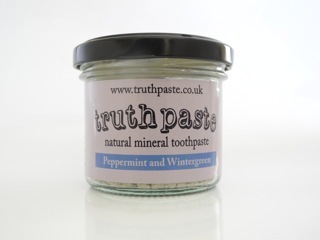 truthpaste comes in a reusable and recyclable glass jar to help reduce the use of plastic toothpaste tubes. truthpaste has a nice, strong flavour. *Aloe Barbadensis Leaf Juice, Calcium Carbonate, Bentonite, Xylitol, *Mentha Piperita (Peppermint) oil, Sodium Bicarbonate, *Melia Azadirachta Seed (Neem) oil, *Gaultheria Procumbens (Wintergreen) Leaf oil, *Eucalyptus Globulus Leaf oil, Commiphora Myrrha (Myrrh) oil, **Limonene, *Citrus Medic Limonum (Lemon) Peel oil, *Eugenia Caryophyllus (Clove) Bud oil, Cinnamomum Zeylanicum (Cinnamon) Bark oil, **Eugenol, **Linalol, **Benzyl Benzoate, **Citronellol. *Aloe Barbadensis Leaf Juice, Calcium Carbonate, Bentonite, Xylitol, Sodium Bicarbonate, *Foeniculum Vulgare Dulce (Fennel) Fruit Oil, *Melia Azadirachta Seed (Neem) oil, *Eucalyptus Globulus Leaf oil, Commiphora Myrrha (Myrrh) oil, *Citrus Medic Limonum (Lemon) Peel oil, *Eugenia Caryophyllus (Clove) Bud oil, Cinnamomum Zeylanicum (Cinnamon) Bark oil, Limonene, **Linalol, **Eugenol, **Benzyl Benzoate. truthpaste has been tested and certified according to EU regulations. truthpaste and its ingredients are not tested on animals, only willing humans! Your mouth will start producing saliva - no need for water! truthpaste is made in Brighton, UK by Marisa. truthpaste began in 2014. Marisa wasn't satisfied with conventional toothpaste so after hours of research and experimentation, she found a recipe that helped reduce the sensitivity of her teeth. Marisa began working to remineralise her teeth, and with diet change and her natural toothpaste formula, her teeth began feeling stronger and cleaner. It has been over a year of recipe tweaking and testing to finally create a formula Marisa is proud of and ready to share with others. We loved it, we hope you will too.